Polyrhythmic music is a characteristic music practice in most African cultures. 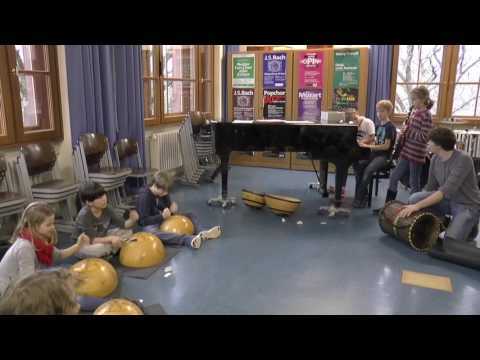 In this module section, pupils develop a popular rhythm from West Africa. The interlocking of rhythms produces its own rhythmic melody through the different pitches of the drums, resulting in a kind of conversation between the instruments. 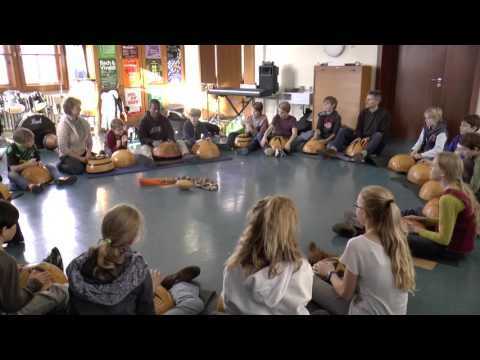 After learning the rhythms in a simplified version for practice at school, pupils develop their own rhythmic-melodic dialogues in groups and create a performance. A notation of the rhythm is attached for instructors. Pupils learn the KuKu by listening – imitating – recreating/ creating anew, all in line with oral-auditory traditions. Kuku is a popular festive rhythm from West Africa. Originally, the rhythm was played, accompanied by dancing in a circle, when the women returned home from fishing. While traditionally, low tuned djembes (West-African skin drums) are used to play this rhythm, other instruments, such as Doundounba, Sangbang and Kenkeni (West African bass drums) are also often used for the Kuku today. In the following example, the simplified rhythms are played on calabashes or, alternatively, on school skin drums (where available). Pupils and teacher sit in a circle with a calabash in front of them. Teacher plays rhythm 1. 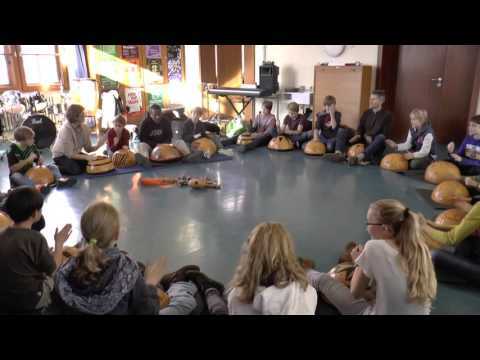 Alternating with the teacher, pupils practice rhythm 1 either individually or in groups. Repeat with rhythm 2. 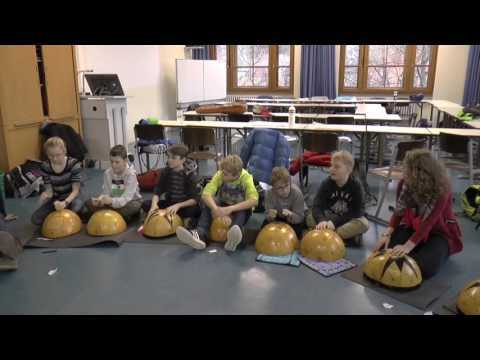 Alternating with the teacher, all pupils, either individually or in groups, play rhythm 2. Pupil1 plays one of the two rhythm patterns once and, via eye contact during their play, picks pupil 2 to play next. Pupil 2 responds with either rhythm pattern 1 or 2 and signals to pupil 3 to continue the play. The change of rhythms should be played without interruption in a continuous beat. Pupils play in 2 groups. Group 1play rhythm 1, group 2 respond with rhythm 2. Both groups play the rhythms alternately one after another. Both groups play their rhythms together in a first polyphonic play. All continue to play call and response, alternating between either teacher and pupils, or between group A and group B. 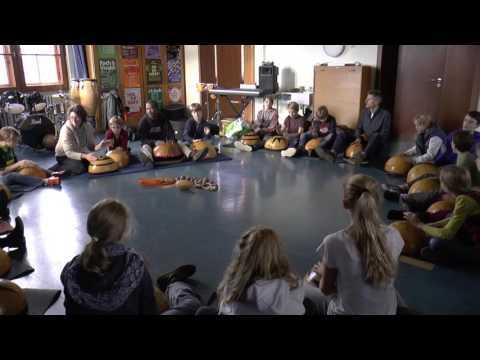 Further on, the rhythmic call signals a change in the musical play to which pupils need to react with particular attention. The call can, for example, announce a change of rhythm, a break, a change from tutti to solo, or it can end the play. Teacher divides class into groups of 5 – 6 pupils each. The groups go into different rooms, taking either the calabashes, skin drums, or their own instruments with them. Group assignment: “Develop a repeatable rhythm pattern which includes both beat techniques of the calabash (bass beat and flat hand). Play the new rhythm with one or several tones. Select one person of the group to be the “guardian of the beat” who watches the combined tempo. The groups present their rhythm patterns in class. How would you describe the character of the different group rhythms in one word? What challenges did you come across when you developed your rhythm patterns in the group? What ideas do you have for the development of an exciting performance with the call, the group rhythms and the KuKu? tennis balls, small sticks, or other objects are used to play the calabashes instead of hands, which changes the character of the rhythm each time. follow a collective basic beat. hear and emulate rhythmic-metric patterns. understand and imitate musical motion sequences. 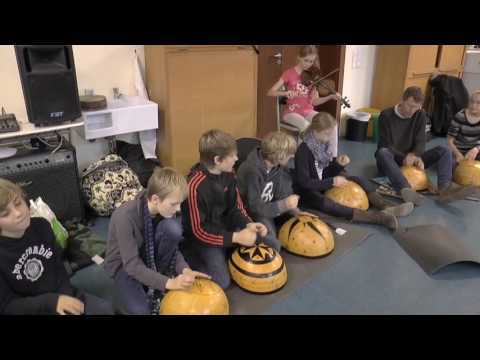 develop their own ideas, based on rhythm structures provided. 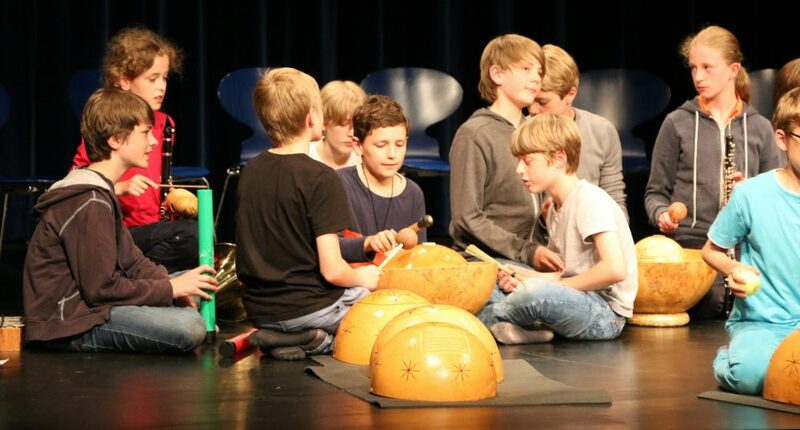 Pupils create, develop and perform their own rhythm and melody patterns, based on a provided rhythm.